When you think of Burberry, there are several standouts that come to mind: the recognizable plaid print, great outerwear, London… Above them all though, is quality. When you buy something from Burberry you know it’s going to last. I have a number of great trenches by Burberry (both for rain and for cold), and a few of their beauty products, specifically this perfume that I continue to replenish bottle after bottle, once I run out. I believe my first designer bag was by Burberry too! The collection has something for everyone this season – a pretty watch for her, a cashmere scarf for him, or adorable sneakers for the little ones. 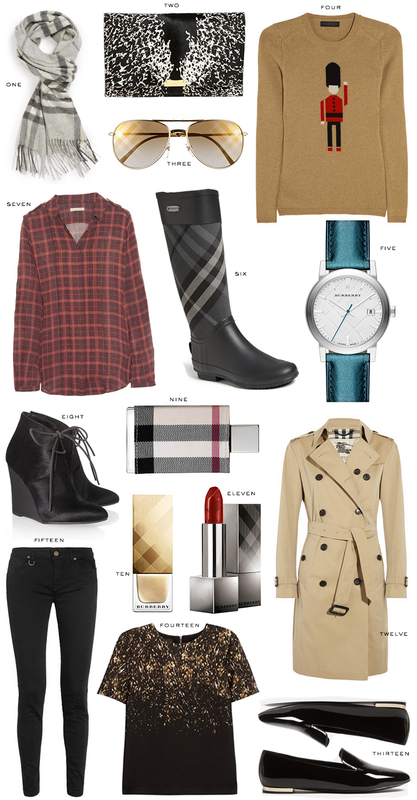 Burberry pieces make great holiday gifts, so be sure to checkout the collection at Nordstrom for everyone on your list! Shop my ten most-wanted Burberry pieces below – see commentary for why I love each one! This post was sponsored by Nordstrom, but all thoughts and opinions are my own. Thanks for supporting the brands that make The Style Scribe possible! Burberry is one of those shows that I look more and more forward to each season – love this roundup especially those wedge heels, insane! Burberry has such classics. Love your picks! Burberry will always be one of my favorite brands – I even did my captsone Marketing project on them back in college haha. When I am home I always scour the Burberry outlet and I have gotten a few amazing winter coats that way. A classic trench is top of my big purchases list! The trench! And those sunglasses are great! I want most of the items you posted! And that trench coat is a classic! those booties (#8) are absolutely amazing. love them!